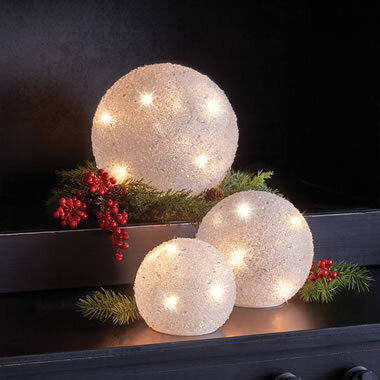 This is the set of three illuminated snowballs that provide holiday ambiance on a mantel or shelf. Each frosted glass globe contains mini LEDs that emit a gentle white glow, a six hour on/eighteen hour off timer, and a flat bottom to keep them from rolling away. Requires nine AA batteries (three for each snowball). Set includes one 8" diam., one 6" diam., and one 4" diam. globe. The Decorative Lighted Snowballs come with The Hammacher Schlemmer Lifetime Guarantee. Items that we sell are guaranteed for their normal life under standard non-commercial use.